Martha called about building a transom for her husband Joe. They have a beautiful home on Santa Rosa Island in nearby Pensacola Beach. 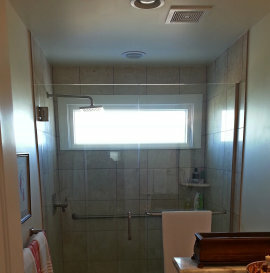 Their tile shower had a high transom window with an exterior frosted glass already in place. The morning sun comes through this window, so Martha wanted a bold and colorful theme to take advantage of the light. She liked the design and color combination of Lauren's Transom, pictured below. Joe's Transom measures about 13" x 45", contains 113 pieces of glass and was completed in February, 2016. Because they live at the beach, she wanted a nautical influence in her transom. She decided on compass rose as the central element and took some of the Victorian frills out to gives her window more of a masculine look. We added a number of jewels to create a prisms effect in the morning sun. 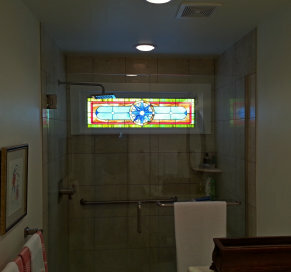 Her color choices were perfect as the glass transforms the neutral bathroom to a rainbow of colors.